Personal Injury cases are typically, a means to communicate that some individual or group has been aggravated by the actions of another party. It is a civil suit filed against parties which can be an individual, a group or even a government entity for careless and malevolent conduct resulting in harm or severe loss for the plaintiff. A personal injury case is less about win or lose and more about trying to preserve your dignity. The judicial process is complex and demands that, exasperat>ing compromises be made sometimes. Owing to technicalities and the truculent nature of litigation, it is unavoidable and more often than not, diminishing. Therefore, situations are bound to arise where you may be forced to seek arbitration. Mostly, it is advisable to go with the flow and do what is best for everyone. After all, elongating any process of the law only creates hardships for those involved. But when it becomes a matter pertaining to the upkeep of your dignity or an attack upon your freedom (physical or financial), the gloves must be off. Every choice must be explored and all the alternatives carefully perused before putting your finger on anything. Personal Injury claims are one such field of play where it becomes imperative to look for a certain set of traits in the person who may represent you. Utmost care and consideration must be implemented in choosing such a person. Most people give in to the urge of saving big and often make the mistake of going with a public defender. Simply, throw away your purse and ask nicely to be declared indigent. Nobody is questioning the capabilities of public attorneys here, after all, there is a lot of competition for a position in the judicial system. Public defenders are mostly low profile, serious and committed to the job (which is to provide the best possible defense to the litigant). It saves a considerable amount of litigation fees and helps to overcome severe financial drawback in the blink of an eye. Many have used it for genuine reasons and others, just to save a buck or two. But is it really advisable? After all, if public defenders are so great and save so much money, why does the concept of private attorneys exist at all? Let us find out. A very enlightening study conducted by two economists was published in the New York Times regarding the differences between being represented by a public defender against having an attorney on retainer fight the good fight for you. The study utilized economic tools to account for the various dependent and independent factors involved in the case. Methods like regression analysis were used to account for the presence of uncontrollable factors and to bring the different quantities under the purview of the study in an efficient and unbiased manner. 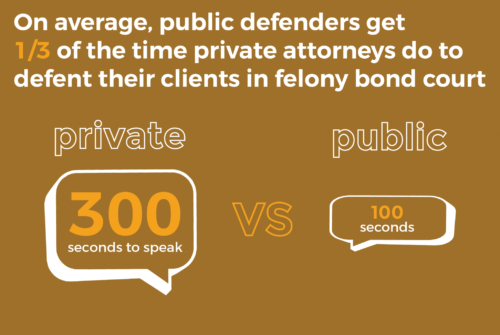 Average sentences for litigants represented by public defenders were more or less, three years longer than those represented by private lawyers. It would be appropriate to mention here that different regression analysis combinations were used in the study to prevent any single factor or cause having a huge impact on the results of the study. Once the severity factor was normalized unlike before, it showed not three, but five more years of prison which is worse than before. Peeling off a few layers, it became clear. The primary assumption that public defenders handled more serious cases than their private counterparts was not true in a lion’s share of the circumstances. 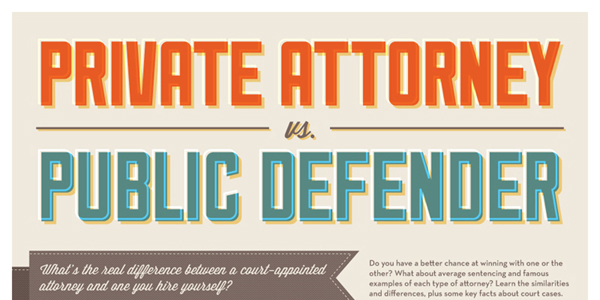 This gave way to the harsh truth that tough situations often warranted a retained lawyer instead of a public defender. Better paralegals, diverse research techniques and considerable resources to back a case is what drives private practices. That the success rate of public defenders is not as good as it seems on the surface. As soon as the ante is upped on the nature of charges and harsher penalties begin to make their presence known, the balance tips in favor of hiring a private attorney. Now, it must be easier to figure out the rationale behind the consistent demand and fantastic records of private attorneys, especially personal injury lawyer Toronto. Is there someone to blame? Well, no. As it turns out, it is in light of the fact that public defenders are often swamped. Owing to the incessant workload, there is bound to be a lack of one-on-one sessions with the clients. They are paid miserably, yet expected to work round the clock. Moreover, the absolute absence of unadulterated motivation for local politicians to allot funds to this case is alarming at best. No one wants to go to a lawyer unless they absolutely have to, and this is reflected in our public and fiscal policies. Public defenders are also known to work around a limited geography. Most are appointed to certain courts and know their way around the ins and outs of those places. It may seem a like a boon initially. But soon, it becomes a liability when personal equations and selfish considerations find a place in the crevasses of the judicial processes. The heavy workload combined with the constant reminder that going against the judge in front of you at the moment, can push back your standing in a personal capacity and this is not acceptable. Not when you are scheduled to appear for another hearing after lunch. Add to all this the lack of careful individual attention, slow response and lethargic gait of judicial progress and you have got yourself a recipe for failure. So, weigh your options carefully and decide only after you have done your due diligence. Litigation is never to be taken lightly. Therefore, always be mindful of who you are choosing to represent you. If it is up to you, it is just a matter of understanding of the legal process, the financial constraints and the amount of individual attention you think is required to see through your case. Ultimately, the ball is in your court. Hence, choose wisely, for it is you and only you who is going to have to live with the outcome and nobody else.